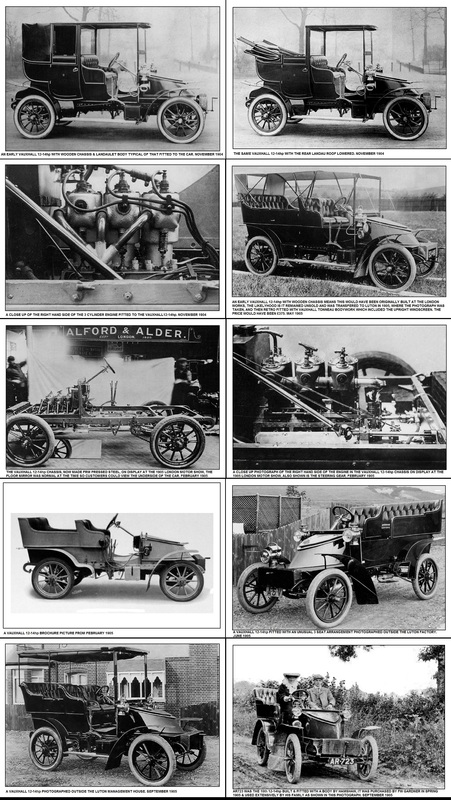 At the beginning of 1904 the fledgling British motor industry was ballooning in size, as it was across Europe & America, with a myriad of new models from an equally bewildering number of manufacturers that were either starting from scratch or established companies from non-related industries moving in to the motoring world and all doing their best to get a slice of the action – motor cars were very much “in fashion”. In the face of this mounting competition the small single cylinder Vauxhall was becoming increasingly pushed to the back of the queue in the desirability stakes. The modest performance was countered by the slow revving engine which was quite reliable by the standards of the time and had gained a credible reputation for Vauxhall as a small but generally well respected motor car manufacturer. However, by the second half of 1904 the single cylinder car was pretty much obsolete. Earlier, in May 1904, with the qualified sales success of the Light Car and the beginning of some sort of “motorsport” recognition, F W Hodges began laying out plans for a larger (longer) and more powerful version of the original 5 & 6hp car. He & his fellow directors discussed various new model development options and had all agreed that a move upmarket was the best path to follow, this would require a multi cylinder engine capable of 30 to 35mph cruising with four passengers on board. The Vauxhall reputation for reliability would need to be maintained and with as minimal maintenance tasks as was possible for the time. Buyers attitudes were changing, the motor car was no longer bought just by customers who had money to fritter on a fun “toy” that someone else would look after, normally a personal chauffeur. The 10 to 15hp range was becoming one of the fastest growing segments of the motor car market and purchasers, while still wealthy, saw the car as more of a means of transport rather than a novelty but they were not willing to be part time mechanics in order to keep their machines in running order. 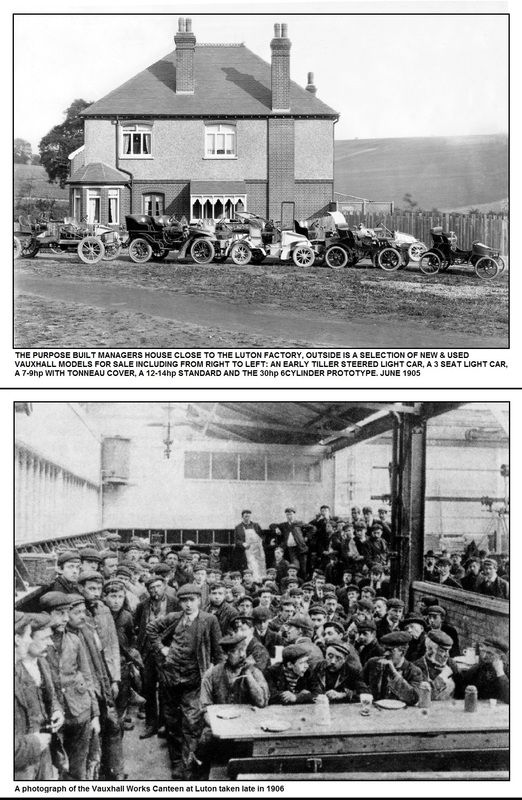 To compound the problem of what sort of car to make, Vauxhall also needed to move to new premises if any reasonable quantity of cars were to be produced and not least the fact that the lease on the Wandsworth Road yard was due to expire in 1905 & would require either renewal or face the prospect of eviction, at the time Vauxhall employed around 200 people directly involved in car production. Fortunately, in April 1904 the Company had purchased a six-and-a-half-acre site in Gallows Road Luton, later referred to as Kimpton Road, where a new factory was planned and, if required, there was also room for expansion in the future. This proved to be extremely prudent & far sighted forward planning move on behalf of the Vauxhall management. It was also actively supported by Luton’s Chamber of Commerce who were concerned at the rapid decline in hat making which was the town’s staple industry. Most of the time F W Hodges spent designing the next Vauxhall car was expended on the new 3cylinder engine. The starting point for this was, in principle, a clever amalgamation of 3 of the single cylinder 5/6hp units and was the reason why each cylinder was cast & water jacketed separately using a “T” head with valves on opposite sides. With 3 3/4ins bores and 4 1/2ins stroke the total capacity was 2445cc and was governed to 1300rpm. However, Hodges was to make some significant and worthwhile changes in order to improve performance, reliability and ease of repair. The engine featured a robust aluminium crankcase with the crankshaft supported by 4 main bearings lubricated from a dashboard mounted oil tank. Although the engine structure was purposely designed to be stronger than the previous single cylinder unit Hodges still incorporated large access panels on the sides of the crankcase and a detachable oil chamber below. In the end reported failure of crankshafts or con rods on the 3cylinder engines were minimal. The twin camshafts were mounted in the crankcase and driven by exposed spur gears from the front of the crankshaft with the governor and high tension trembler coil ignition distributor from the front of one camshaft and the water pump from the other. Engine speed was controlled by progressively moving 3 tapered spacers above the inlet tappets thereby reducing the lift of the valves and therefore slowing the engine down, the governor could be overridden by a lever on the steering column with a similar lever to control ignition timing. 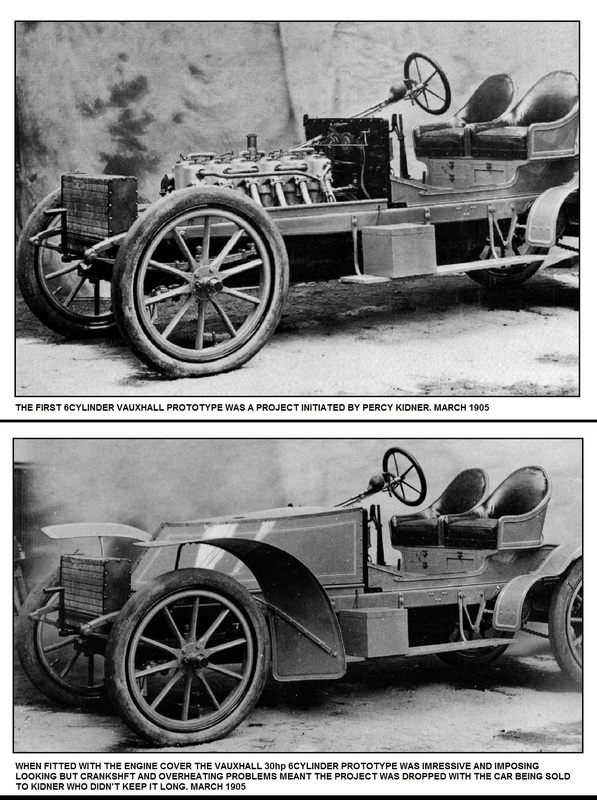 Engine cooling was initially the same system as that used on the previous Light Car and mounted low at the front between the chassis dumb irons which meant the previous “V” shaped bonnet design could continue to be used. The braking system broke no new ground and followed an established configuration for the time, metal to metal action with the footbrake working a drum on the output shaft of the gearbox while the handbrake worked drums on each of the rear wheels. By contrast, the steering was unusual; the column was mounted at a distinctively shallow angle and operated a pinion & sector system which then turned the front wheels. On most cars at the time clutch control was either in or out making smooth driving almost impossible, the Vauxhall 12-14 used the same cone clutch that was almost universally accepted but added small leather pads which gave the feel of a two stage engagement and made the car far easier to drive. The gearbox was a straightforward 3speed plus reverse with the final drive by chains either side of the car to the rear wheels. Unlike the original Light Car, the Vauxhall 12-14 reverted to custom and practice for the motor car industry at the time with a separate wooden chassis, reinforced with steel flitch plates, and half elliptic leaf springs fitted all round with beam axles front & rear. The dimensions were: wheelbase 69ins, length 106ins & width 49ins. By November 1904 the Vauxhall 12-14 had completed all of the testing successfully and proved that it was smooth, quiet as well as being reliable and so Vauxhall confidently announced the new 12-14hp 4 Seat Touring Car to the motoring press and confirmed the car was in production and available for £375 with some stock models with a wooden chassis but that all future production models would use a pressed steel chassis. The price was a considerable increase compared to the previous model but did include side & back paraffin lamps, complete set of spare tyres, pump & repair kit. The car was capable of between 28 & 36mph, depending on what gearing and body the customer opted for, with an average fuel consumption of 20mpg. Initial optional factory items included a full upright windscreen with or without a Tonneau cover. The Company was so confident in the car they released a standard 12-14hp to “The Autocar” motoring magazine for evaluation immediately after the press launch, their comments on the car were all very favourable. Vauxhall also offered the 12-14hp as a running chassis only for £330 whereby an owner could then specify a body from a multitude of approved coachbuilders, the downside was that some of these coach built bodies could easily double the overall price of the completed car. The chassis numbering followed the standard Vauxhall practice for the 12-14hp and ran from 3C1 onwards. 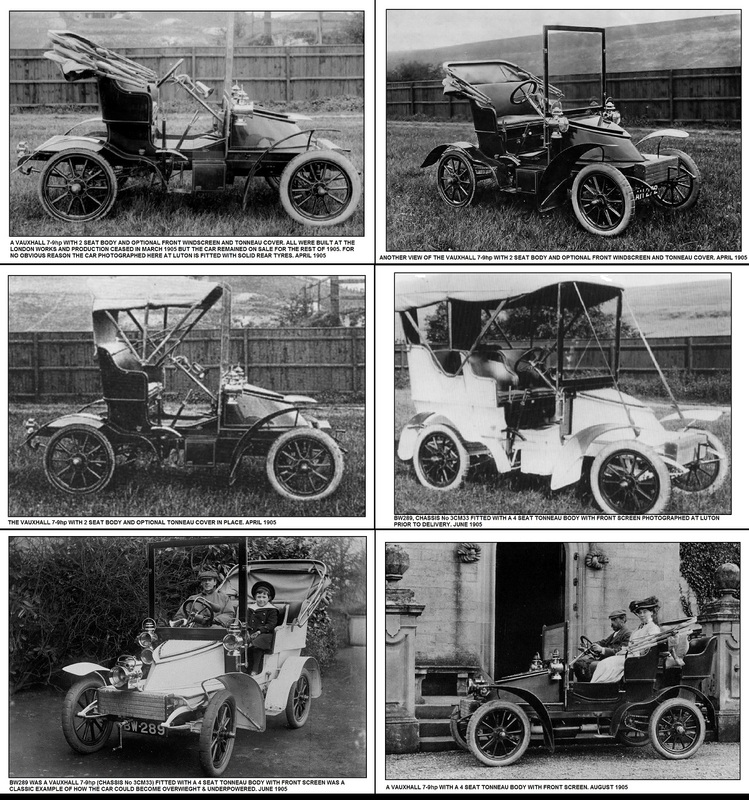 The first public showing of the Vauxhall 12-14hp was at the Olympia Motor Exhibition in February 1905 with both fully built and chassis versions displayed. After the cars launch there was a small but steady stream of orders for the 12-14hp with a total production of 32, 20 made at the London Works and 12 at the new Luton factory. In September 1905 Vauxhall entered a 12-14hp in the Isle of Man Tourist Trophy driven by Vauxhall manager AJ Hancock. The car was a standard 12-14hp with Tonneau cover and surprisingly still fitted with an engine governor. In order to prevent overheating the car was, remarkably, fitted with a 6 speed overdrive gearbox (yes 6 speed!!) to keep the engine revs to a minimum and used 2 gear levers. Having completed the first lap well behind the leaders Hancock suffered a wheel breakage during cornering on the second lap and was thrown out of the car. Luckily, he was not seriously injured but both he and the car were forced to withdraw from the competition. 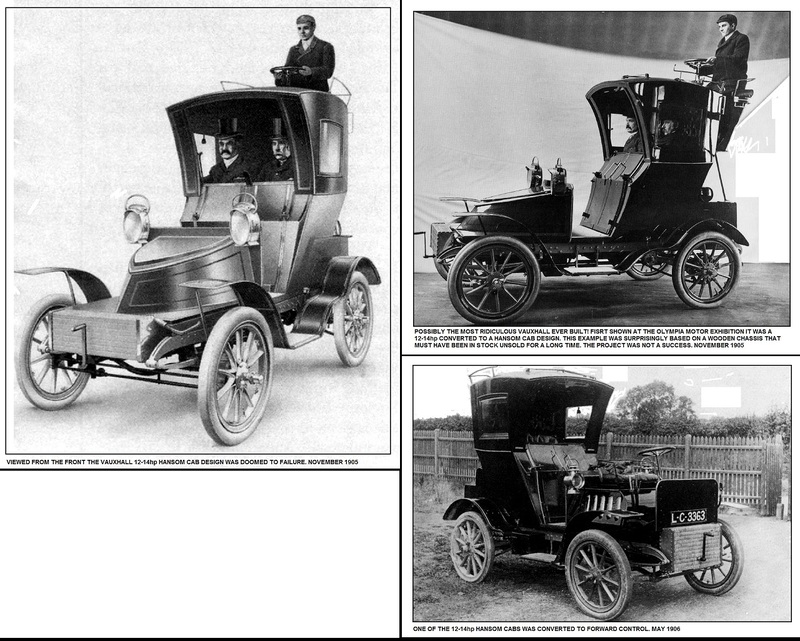 Even more amazing was the 6 speed gearbox was then advertised as standard equipment for the 12-14hp from September 1905 but very few examples of the model were built until production ceased in January 1906 but was listed until May 1906. Percy Kidner’s pursuit of speed and competition success led to an unusual modified Vauxhall 12-14hp project which he personally commissioned. It was listed as a Vauxhall 30hp 6cylinder on Company records and was the first ever 6cylinder Vauxhall and registered in March 1905 with the number BM524. The chassis was heavily modified with the section forward of the bulkhead extended whilst the rear section was shortened as only 2 seats were required. The gearbox was mounted centrally with twin chain drive to the rear wheels in a similar vein to the standard 12-14hp although the overall gearing was considerably higher. The 4890cc engine was essentially 2 standard 3cylinder engines paired together with a specially fabricated bottom end and crankshaft running on 9 (not 8) main bearings. The fuel system was a rudimentary pressure fed system as opposed to the normal gravity feed. Due to chronic crankshaft “waggle” the engine was governed to 1000rpm and even then it had a propensity to break crankshafts after minimal mileage, the lubrication system that was adequate for the 12-14hp engine could not cope effectively with 6cylinders, it also suffered from constant overheating. 30hp is probably a bit optimistic as a power output, 25 would be more realistic. Vauxhall had taken a single cylinder engine and then created a 3cylinder engine but the same principle applied to a six just didn’t work. The project was dropped by Vauxhall but the car was actually purchased by Kidner in July 1905 who then offered it for sale in December and again in March 1906 in “The Autocar”. Impressive looking, a creative idea but in the end a very costly misadventure. The last “idea” for the Vauxhall 12-14hp was displayed at the Olympia Motor Exhibition in November 1905 and was quite possibly the most ridiculous looking Vauxhall ever built. The Earl of Ranfurly was a very wealthy customer of the London based Metropolitan Motor Cab Company and put forward a suggestion for a motorised Hansom Cab of which the horse drawn variety were still popular at the time. Rather surprisingly the MMCC thought it was an excellent idea and proceeded to order 5 from Vauxhall, the first of which was displayed at Olympia. Vauxhall may have done a special deal on the contract because it is known that at least 2 of the Hansom Cabs were built on wooden chassis which would have been stock items for almost a year at the time. The steering was a maze of rods & linkages as were the other controls in order to get control to driver seated at the top rear of the vehicle. The project was not a success for either company, but Vauxhall did take back ownership of one, again with a wooden chassis, and convert it to forward control in an effort to attract interest – which it didn’t. In the end the car was used by the Company to run errands to and from the bank in Luton. When the Vauxhall 12-14hp was announced and sales began there was a considerable resistance against the car from owners of the single cylinder Light Car, although the 12-14hp offered more seats, power and performance it came at a huge increase in price. Light Car owners were happy with the type of car they had purchased originally and wanted a similar replacement, Vauxhall received feedback from their distributors telling the same story. Vauxhall management realised in order to hold on to the loyal Light Car owners they would need to build a true successor which would fit their needs – smaller and cheaper than the 12-14hp. Work started in late November 1904 and the project was referred to internally as “The Miniature Car”. In almost all significant aspects the car was literally a downsized version of the 12-14hp, the engine was the same 3cylinder design, governed to 1300rpm, but with a 3ins bore & 3 3/4ins stroke giving a capacity of 1293cc, the wheelbase shrank to just 69ins and the total weight was 10 1/2cwt. There were some small differences, the carburettor was repositioned at the back of the engine block in order to ensure gravity feed from thee under seat fuel tank when traversing steep gradients and the reduced size also meant steering track rod was repositioned behind the front axle. 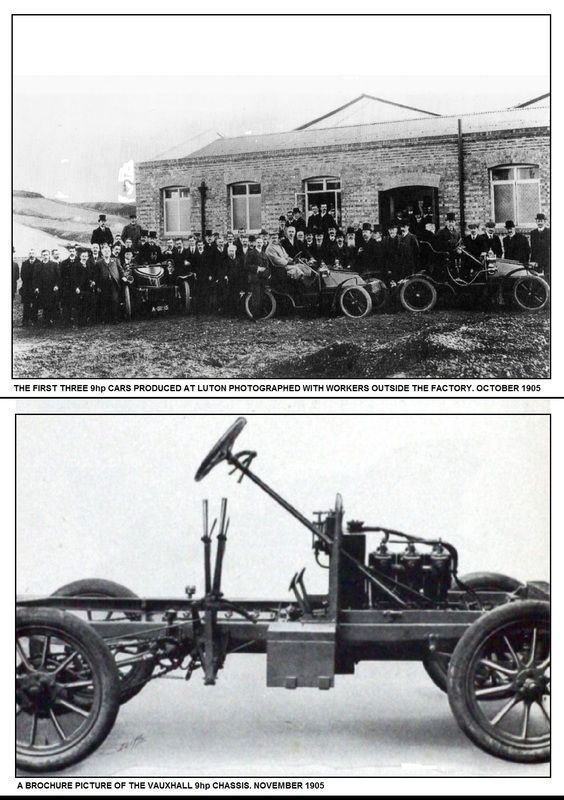 The car was advertised at £210 for the 2 seat version and £190 for the chassis only, the performance of the standard 2 seat model was adequate, 38mph, but when the chassis was fitted with some heavier 4 seat coach built bodies the car became very slow and underpowered, top speed went down to 29mph. The fuel consumption averaged 24mpg again depending on the body specified. Options such as the upright front screen didn’t help performance either. The Vauxhall 7-9hp was announced by the Company in January 1905 and was shown publicly at the Olympia Motor Exhibition in February in both fully built and running chassis variants. 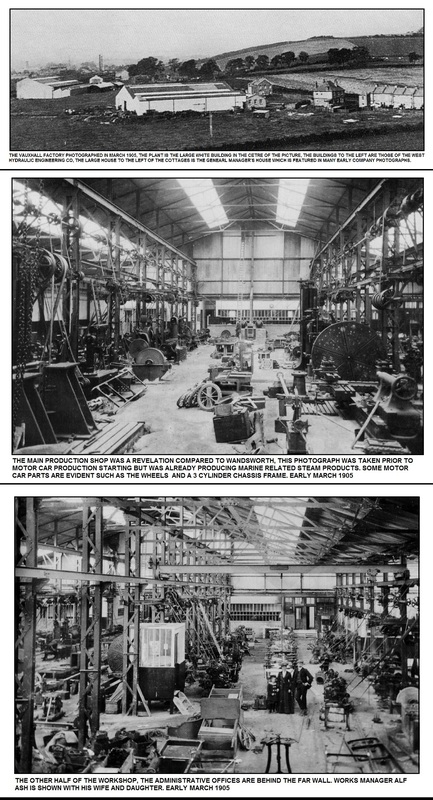 With the impending move to Luton, motor car production at the London Works concentrated on 7-9hp production right up until the move with a total of 52 being built, none would be produced at Luton. 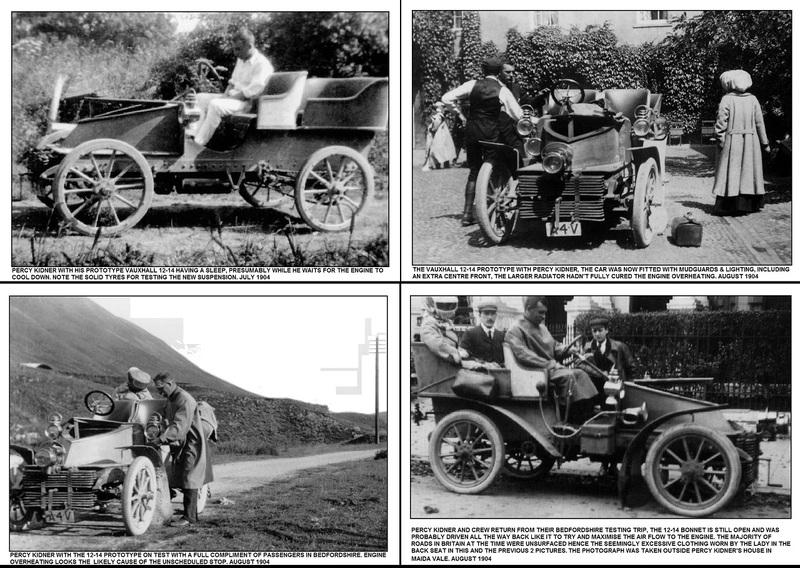 The first competitive event Vauxhall entered in 1905 was the Scottish Automobile Club Trials which ran from 10th to 13th May, surprisingly Percy Kidner chose to enter a 7-9hp model. Kidner was confident it could hold its own against the larger competition, the 7-9hp was the smallest, cheapest and only 3cylinder car to compete which made the decision rather strange. Unsurprisingly, the car did not acquit itself well, suffering numerous mechanical problems, and after leaving the official observer by the roadside in order to climb the Devil’s Elbow on Glenshee in reverse Kidner and the car were disqualified even though the car did complete the remainder of the trial. Despite the Vauxhall 7-9hp shortcomings the model proved more successful than its larger sibling but it was withdrawn from sale after all the London built stock had sold out at the end of 1905. To most people moving house once in a lifetime is once too often, moving a manufacturing company today involves a huge amount of logistics & co-ordinated transport. Moving a heavy manufacturing company in 1905 was a whole lot more difficult, a mammoth undertaking by any standards, but that’s what Vauxhall did, they moved their entire manufacturing facilities for cars and also their marine business 50miles north of London to Luton. During the latter half of 1904, following the purchase of the 6 ½ acres of land in Luton, a large workshop had been erected the main part of which measured 180ft x 130ft. Over a period of six weeks all the marine related machine tools were transferred from Wandsworth Road in order that production of the range of steam related products could be maintained with minimal disruption. The marine related steam products were still an integral part of the Vauxhall business at this time. Alongside the workshop building was a drawing office, an administrative office and other essential elements needed for effective management of the Company. A separate Managers house was built close by along with a terrace of hoses for employee accommodation which still left room for further factory expansion if required – which it was far sooner than anyone at the time realised. With the marine side of the business in situ at Luton and operational the next priority was to get all the associated equipment for motor car manufacturing transferred to Luton. This was left as late as was feasible in order to produce as many 7-9hp models as possible before the complete closure of Wandsworth Road. Transfer of all remaining Wandsworth Road equipment was completed by the 3rd week in March and chassis production started almost immediately. Having closed the Wandsworth Road works Vauxhall considered having a London address was still desirable in terms of prestige and also for export clients and so premises at 45 Leadenhall Street London EC were retained and used in all Company advertising. 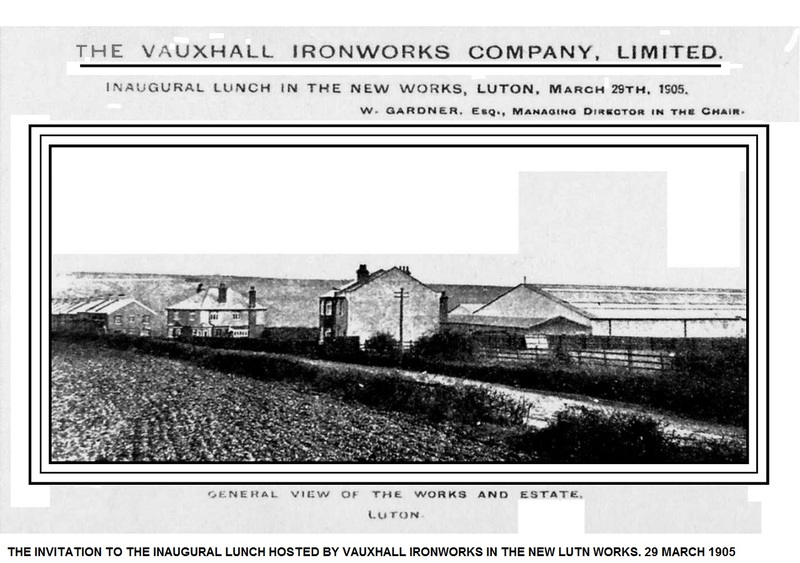 Vauxhalls neighbours on the site at Luton were The West Hydraulic Company who, in 1903, had moved from Leeds to a similar 7-acre site adjacent to Vauxhalls factory. Within two months the companies had amalgamated to form The Vauxhall and West Hydraulic Engineering Co Ltd, in reality it was a takeover by Vauxhall but nobody seemed to mind at the time, however it strengthened the non-automotive side of the Vauxhall business. The new Company had nearly 14 acres of available space and were right next to the main rail line to London. To counter press and customer criticism of the 7-9hps lack of power and to continue the cars relative success Vauxhall enlarged the 3cylinder engine to 1669cc by increasing the bore to 3 1/16ins & stroke to 4 1/4ins, a full 28% bigger than the 7-9hp model. The car was launched at the Olympia Motor Exhibition in November 1905. In standard 2 seater form the car did 42mph and gave 24mpg which was very creditable, unfortunately, the demands of customers for ever greater protection from the elements meant that bigger, more cumbersome and particularly heavier bodywork was being specified which did all but negate the increase in power. In all a total of 27 9hp models were produced and were all from Luton as would everything else be until 1964. Rather optimistically, in October 1906 a Vauxhall 9hp was privately entered for the Blackpool Speed Trials by owner Lieutenant Hawkins, the car covered the flying kilometre in 1min 21secs at a speed of 27.3mph, unsurprisingly the car was last in its class. Perhaps the result was the reason for ordering a new Vauxhall 12-16hp to take back with him to India. 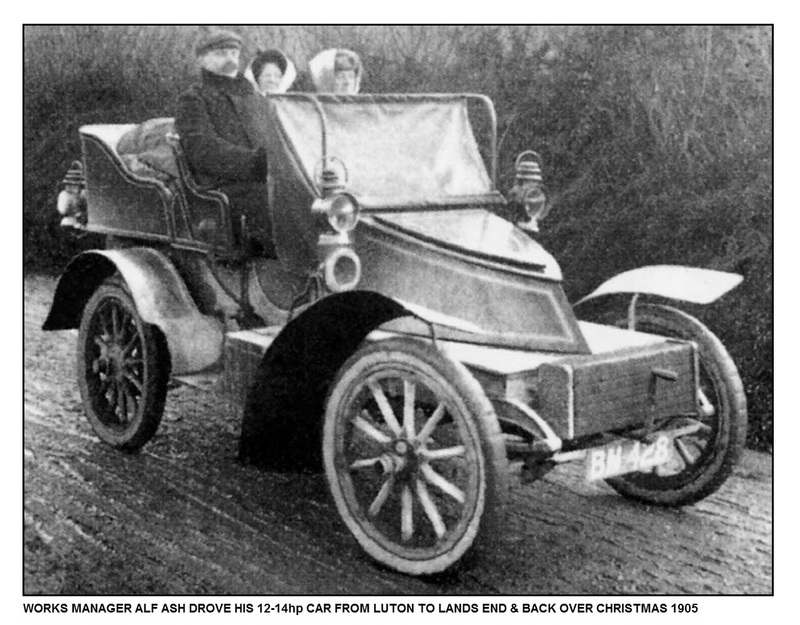 The last 9hp model left Luton in September 1907.